I used to feel guilty about not having a formal program that could be labeled “family ministry.” I partner with our Children’s, High School and Young Adult Pastors, but we’re not a formal “Family Ministry Team.” But I stopped feeling guilty when I realized I do quite a bit of family ministry. However, it is woven throughout my ministry. And I wonder if it might be in yours too. As I have studied and reflected on Deuteronomy 6:4-9 over the years, I have realized that God gave this great guide for family ministry. Verses 6-7 sum it up. I like the Message translation best: “Write these commandments that I’ve given you today on your hearts. Get them inside of you and then get them inside your children. Talk about them wherever you are, sitting at home or walking in the street; talk about them from the time you get up in the morning to when you fall into bed at night.” Basically, wherever you are, all the time, parents are to lead their family in being about God and his commands! I see this through the eyes of a husband, father, and Middle School Pastor. I’m going to focus on that last one today. I am responsible for leading two ministries, one for preteens (5th-6th grade) and one for middle schoolers (7th-8th grade) at Mount Pleasant Christian Church in central Indiana. I have some great friends in a group called FourFiveSix who nailed what Family Ministry Looks like in 2 pieces. The motto of this group, of which I am a part, is to “help your preteen ministry take the next step.” The second part is in our metaphor: “Letting Go of the Bike.” Basically, FourFiveSix wants to help churches take the next step, whatever that is, with their preteen ministry. At the core of that, is helping parents “let go of the bike” of their child’s faith. 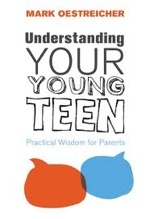 As I equip and encourage fellow parents of preteens, (I have a 6th grader myself), I am constantly doing so through the lens of helping them allow their child to make their faith their own while they “run alongside” and help them on this journey. Then, in working with parents of 7th-8th graders in my ministry, I feel like, (to continue the metaphor), we are helping parents allow their child to ride the bike of their faith around the block. They get more freedom, but within reasonable boundaries. I feel like this ministry is one where “family ministry” really stands out to me. Why? Parents of middle schoolers really want someone to help them. They don’t understand what is going on with their kids, (especially if they have forgotten what they were like in middle school). And I believe they get too many “I’m sorry for you.” and not enough “Let me help you.”, or even at least a few who might say, “Let me walk beside you.” And sometimes, parents of middle schoolers just need us in the church whether as a pastor or small group leader to simply echo to their kids what they are saying at home so that when it comes out of our mouths, the kids will actually listen and accept it! What does this look like in real life? With parents, it starts by helping them known and follow Jesus. Deuteronomy 6:6 commands the parents to be committed before they can lead their children. Sometimes, I help a parent find a good Bible or Bible app. Other times, I’m simply a listening ear or understanding friend walking alongside them through the joys and challenges of parenthood. With parents of preteens, it’s often us as parents who have a hard time letting go of the bike, even though our children are more than ready for the opportunity! So, sometimes I make a simple suggestion that helps a parent like providing a simple tool that their preteen can choose to use in developing a quiet time. Or, it might be that I bring parents in to a service to play games alongside their preteen and see just how much fun this age group is. And with parents of middle schoolers, I ask for directions when I get lost in the school myself! (It’s helpful to show humility and realize that sometimes the best ministry we give families is allowing them to minister to us “experts.”) Sometimes I remind them of the importance of us as parents being parents and knowing that being our child’s friend comes much further down the road. Other times I pray with them and recommend a Christian counselor when problems are beyond what we can handle. You won’t find much of this in my blog, on our church website, or in any printed material you might pick up. But these things are part of the DNA of how we do ministry with families. And keep in mind, these are all different kinds of families with various joys and struggles. For me, especially as I work with families of preteens and middle schoolers, family ministry is not so much about any one specific thing we do as it is about keeping Deuteronomy 6 in mind and helping families live that out themselves in the context of a church community. Although I regularly contact them to voice my thoughts, concerns and suggestions on how they can better help those of us ministering specifically to preteens and middle schoolers, I owe a HUGE amount of thanks to Orange and all they have done to help me and so many others reThink ministry, especially family ministry. Their “orange” concept is brilliant in its simplicity. 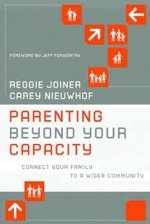 I highly recommend reading Parenting Beyond Your Capacity. I’m reading it right now!